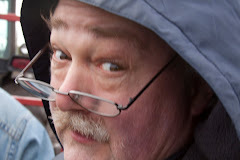 While working for the Film City label, Rodd Keith found his work released on myriad secondary labels - vanity labels, smaller song-poem labels related to Film City, and others whose providence I can barely guess at. Typically, he shows up as Rod Rogers, but sometimes has a different name. Most of those tiny labels have names which have something to do with the label's primary songwriter (such as Kondas and Lutone), have a catchy name (Action and Planet Earth, for example) or at least interesting and perhaps thought provoking (Inner-Glo is a favorite of mine). But what to make of this label, which I've never seen referred to anywhere, and can't find anything about, and which carries the clunky name "B-Atlas". Were they hoping someone would misread it and think it said "Beatles"? I admit that seems unlikely, but it's the best I can come up with. 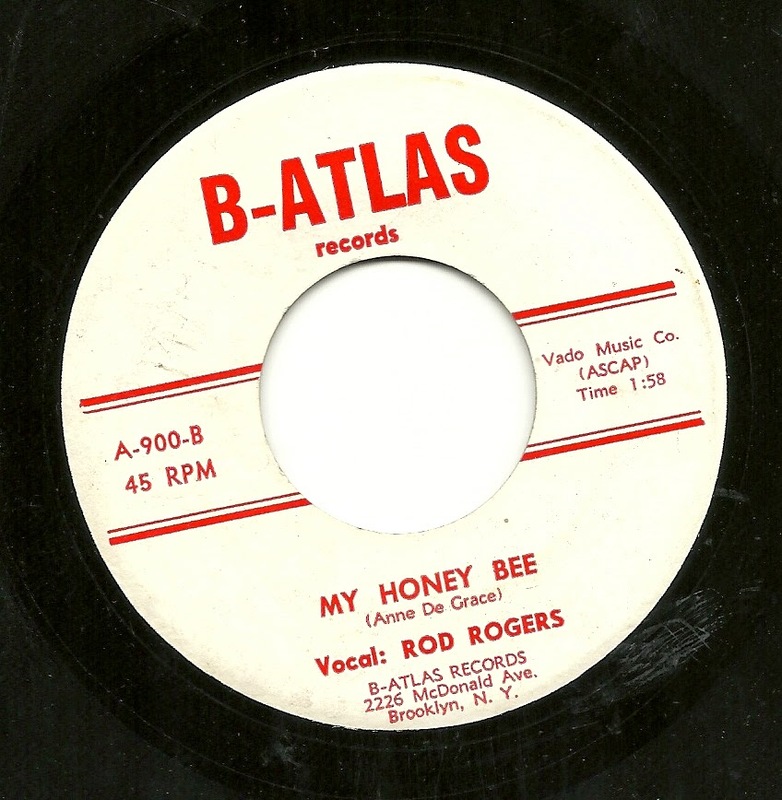 Today's Rod Rogers songs are typical of the Rod Rogers, Film City sound. Neither one stands out to my ears - I'm sharing these at least as much because this label seems to be completely unknown to the song-poem world - but as I'm a fan of his mechanical, Chamberlin driven tracks from that era and label, I find these very enjoyable. First up is "My Honey Bee", a mid-tempo, yet peppy and danceable number. I do notice that there are some lines which do not scan well with the music Rod(d) chose, and he clearly finds those lines a challenge to sing effectively. 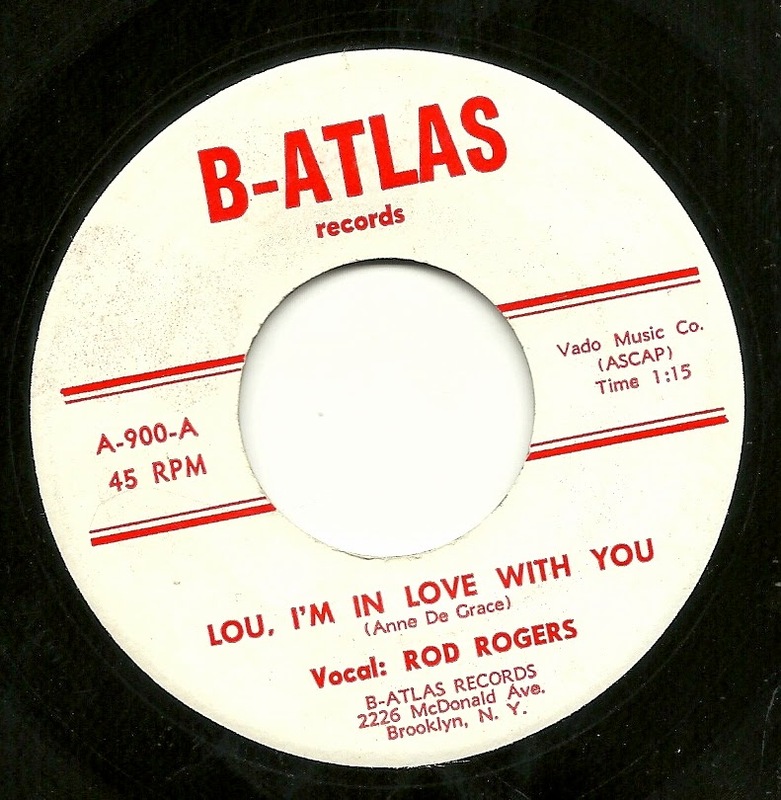 From the same general sound style comes the flip side, the awkwardly titled "Lou, I'm in Love With You". 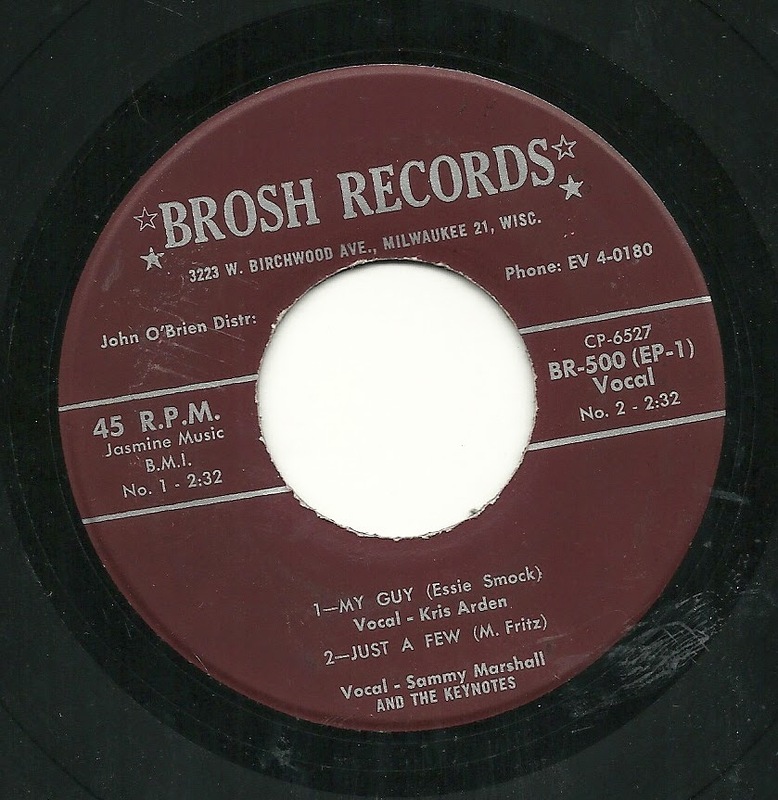 Note that a typo on the label leads to an indication that the song is only 75 seconds long - 40 seconds under its actual length. It's four for the price of two today, here at song-poem central, and what's more, today's EP, on the tiny Brosh label, features four different singers, all but one from the Globe song-poem empire. First up is frequently used Globe female vocalist Kris Arden, with a song not written by Smokey Robinson, nor sung by Mary Wells, yet still titled "My Guy". The backing track is Globe 101 - if not for the lyrics, I'm sure Sammy Marshall would have been singing this. But just listen to these lyrics - her guy sounds like a dreamboat; he's swell. Speaking of Sammy Marshall, he's up next, with a number titled "Just a Few". This is also paint-by-numbers Globe stuff, and Sammy sounds (to me, anyway) pretty darned wistful, as if he believes the songwriter doesn't expect to win the girl. The ache in his voice here doesn't match the promise of the lyrics. By the way, I'm going to make another file of this record tonight and see if it gets rid of some of the harshness of the sax portions (I didn't notice at the time of making this file that there was so much distortion, and the other tracks seem to be fine, so it might just be the track). 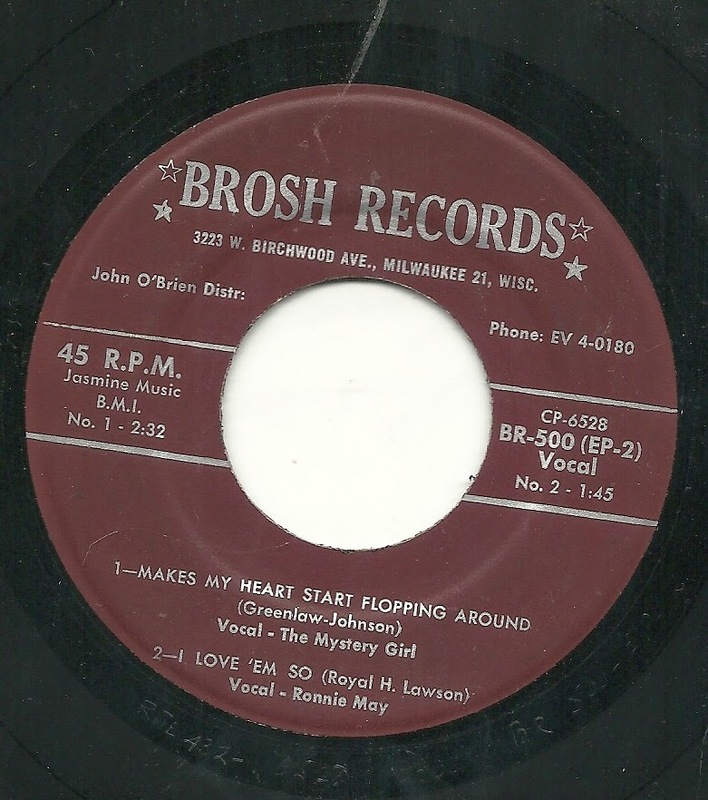 Best of the batch by a wide margin is "Makes My Heart Start Flopping Around", sung by everyone's favorite, The Mystery Girl. Here we have a swingin' little track, with a winning vocal, a nice band sound, and a lyric that, with a few improvements, could have sounded like someone's attempt at a hit record, at least during the late '50's (although I'm pretty sure this record is not from the late '50's). I could do without the honking sax, but that's a minor complaint - this is a fun song and record. I don't believe I've come across the song stylings of Ronnie May before, and I'm not sure what casa-de-song-poems put this masterpiece together, but I'm sort of interested in hearing more. Although I've never featured it on this site before, the Star-Crest song-poem label holds a special fascination for me. Their albums (and it's almost always an album - I've only ever heard of four 45's on the label, and have only ever seen one of those) are unlike the products of any other label, except for perhaps Film-Tone, a label which they are reported to have had some sort of connection to. 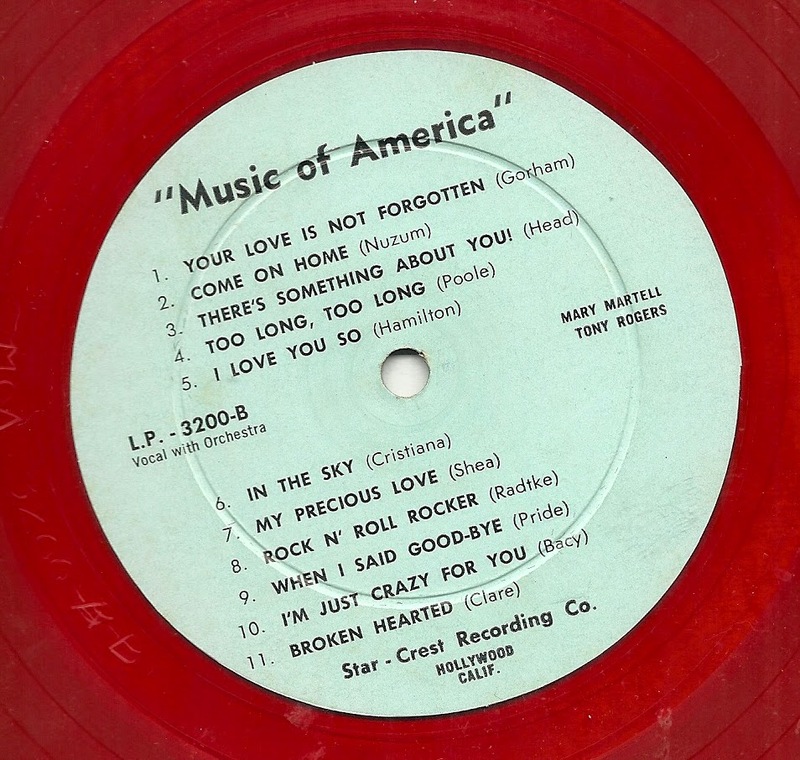 Star- Crest releases are extra chintzy, often described on the label as featuring an orchestra, although rarely actually featuring more than four instruments, and often fewer than that. Their singers are either hopelessly incompetent, or at best are not very good at sight-reading - it certainly sounds to me like these singers have never seen the material before. That was rarely a problem for the likes of Gene Marshall, but the Star-Crest vocalists seem to trip over the melodies quite a bit more than was the average for song-poem vocalists. The songs are also over in a flash. This album contains 22 songs in barely 40 minutes, many of them under 100 seconds long. 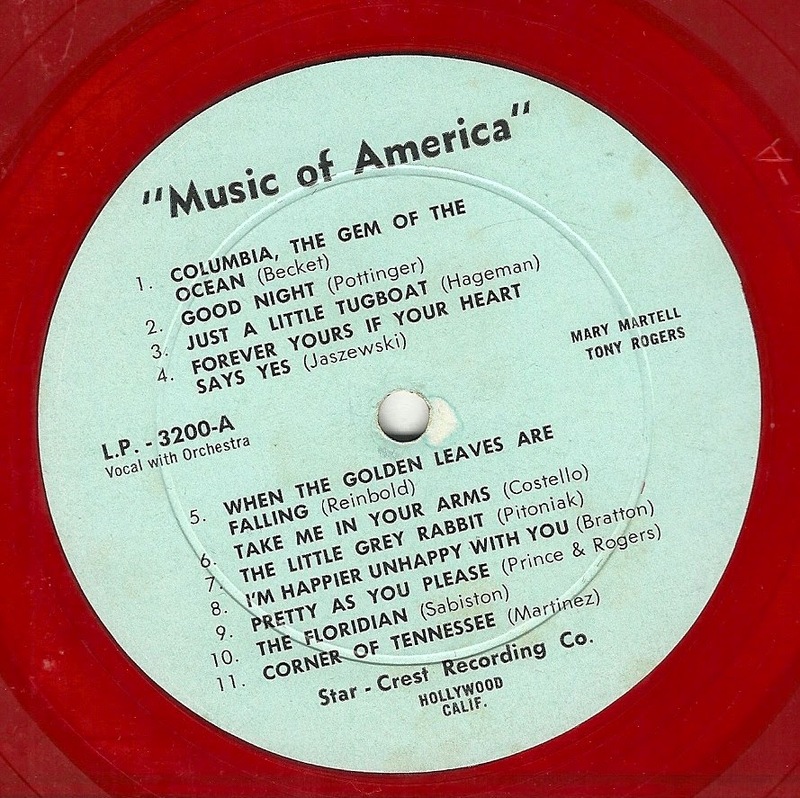 Like many Star-Crest albums, it also contains a genuine hit song from the past, in this case WAY past (hello, public domain), "Columbia, Gem of the Ocean". Then there is the material that Star-Crest received, or at least those lyrics they accepted. Much of their clientele seems to have been stuck in that period of the '30's where exceptionally corny novelties and sickly sweet sentimental clap-trap ruled the day. Those writers whose lyrics were in some way more contemporary (again, see the second track, below) were simply out of luck. Because to nearly all of these lyrics were paired arrangements that simply exist out of time entirely. There is no period in American music that I'm aware of when hit music (or potential hit music) was released which featured vocalists paired with piano, guitar and clarinet (or sax). True demo records are not typically this elaborate - and actual releases on real record labels not anywhere near this sparse. The first example today is the song "The Little Grey Rabbit", as sung by Mary Martell. Here's a lyric which is clearly leading up to a moral, and when it arrives, it's more sudden and perhaps a bit harsher than one might have expected. but her get her in her rocker and she's a freak." That's the "best" line, but the whole thing is amazing, in a car-crash sort of way. Finally, as an example of what some of the other material on the album sounds like - the stuff that isn't hit-over-the-head moralistic or hopelessly misguided, here's an attempt at whimsy, titled "Just a Little Tugboat", sung again by Mary Martell. A full Star-Crest album which I posted several years ago to WFMU can be found here. Love Me, Love Me, Love Me, Love Me, Love Me!!! Well, it seems like every time I get a head of steam lately, something else delays me. My plan was to speed up the posts until I was back on an every Monday or Tuesday schedule, but various issues keep interfering. This week it was a minor emergency involving a family member, now largely resolved. The good news is that I've figured out the sound problem with my turntable, and have uploaded improved sound files to last week's post (the Bob Storm record). That post, with improved sound, can be found here. I'll continue to fix the previous three or four posts as soon as I have time. 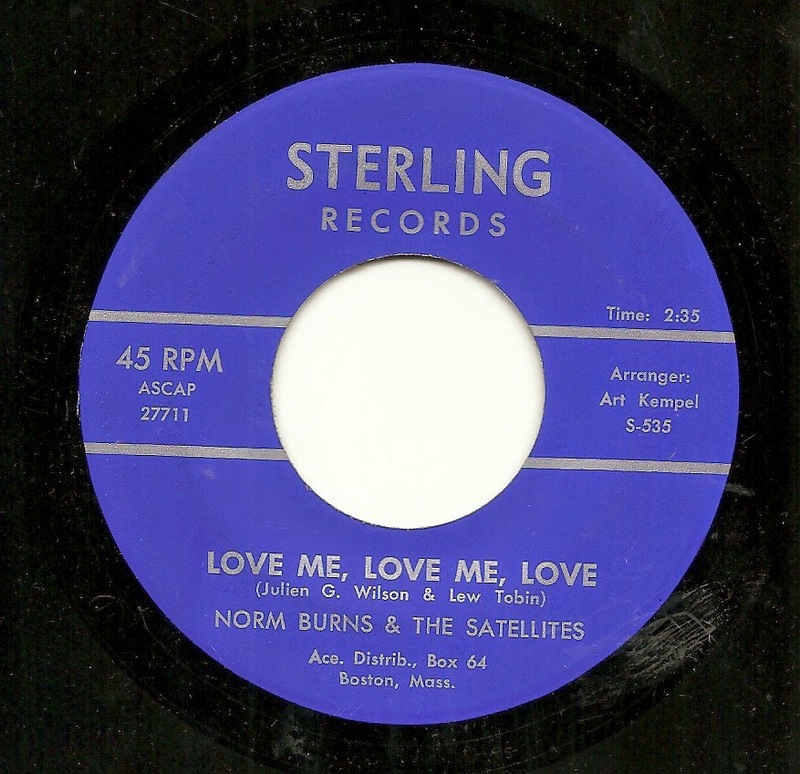 The same family issue mentioned above has left me with little time to offer comments on today's record, "Love Me, Love Me, Love", by Norm Burns and the Satellites. 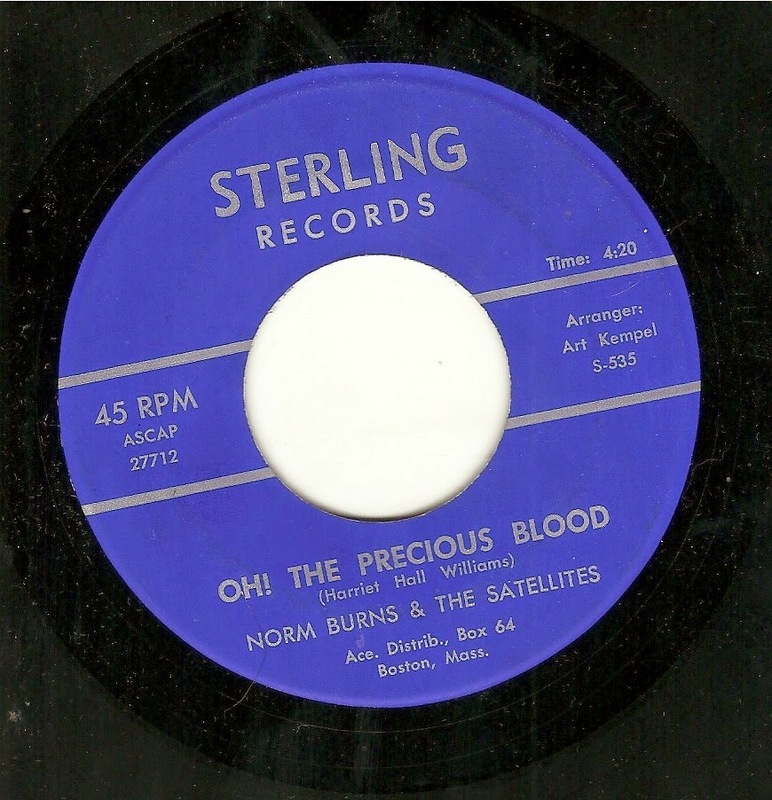 I will say that I rather enjoy the sound of this record, due to the efforts of the spare backing band (dig one of the simplest guitar solos in history) and Norm's unique stylings, but the lyrics are about as basic, repetitive and uninspired as they come. I can say nothing good about the flip side, "Oh! The Precious Blood". I'm not automatically opposed to religious records, but the words here are stultifying and the music is awful. I hope the sound file here worked correctly - I couldn't bring myself to listen to all four and a half minutes of this tedium a second time.